It’s been great to see the career revival of Venezuela’s Jorge Linares since linking up with trainer Ismael Salas. Linares (38-3, 25 KO’s) has reeled of seven straight victories dating back to his March 2012 shock TKO loss to Sergio Thompson and he is coming off of a 4th round knockout over Javier Prieto in December that saw him lift the vacant WBC lightweight belt into the air. The three-division champion is set for a May 30 showdown in London vs. former title challenger Kevin Mitchell and Linares has been looking sharp under the watchful eye of Cuba’s Salas. This past week we caught some lively sparring between Linares and promsing prospect Kenneth Sims Jr. from Chicago. Sims had just finished up a training camp with Manny Pacquiao ahead of the Filipino star’s May 2 loss to Floyd Mayweather, and the work was definitely brisk. 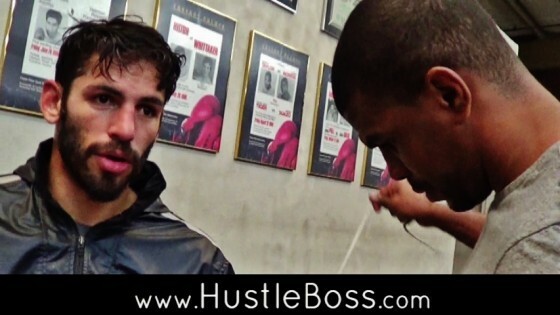 Check out the clip below for Linares’ thoughts on the work as well as the forthcoming Mitchell showdown.